I have always wanted to try this cake. When I look through Pinterest, I would sometimes see this Magic Cake recipe pop up from time to time. So I pinned it to my big cake board. I wanted to give this recipe a go as I was wondering how it would turn out. It has been called a Magic Cake for a reason, so I needed to find out why. Here is the recipe that I used to find out what the magic was! Preheat oven to 170°C/ 150°C fan forced. Grease a 8 inch x 8 inch baking dish. Separate the egg yolks from the egg white and set the egg yolks aside. Beat the egg yolks with the sugar until light. Add butter and vanilla essence and continue beating mixing. Then you can add the flour and mix until all combined. Slowly add in the milk and gently beat until everything is well mixed together. Add the egg whites, a third at a time and gently fold them in using a spatula, repeat until all egg whites are combined. Pour the batter into the baking dish and bake for 40 to 70 minutes or until the top is lightly golden. Check the cake after 40 mins as every ovens cooking time is different. Once the cake is ready take out of the oven to cool. When ready to serve sprinkle some icing sugar over the top. After an hour of baking, I pulled the cake out of the oven and set it aside to cool. I was waiting with anticipation to see what had formed while cooking. Afternoon tea came around, and it was time to cut this cake up. I cut a few slices, and it looked pretty good. There we found what the magic cake did. 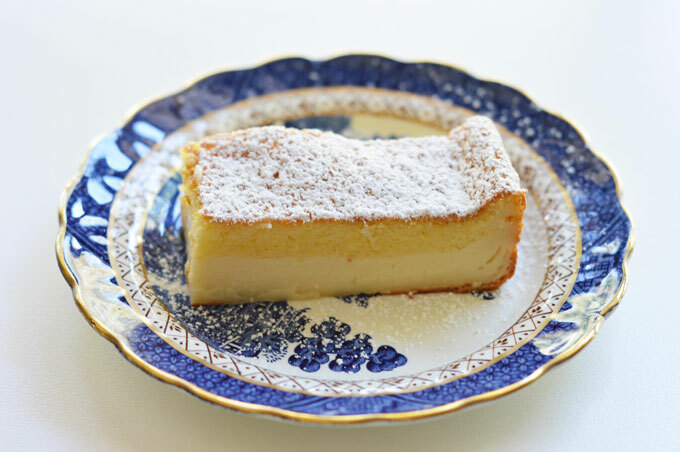 While the cake is baking, a base and a custard filling form finished off with a moist cake on top. That is the magic! The verdict: my hubby and I loved it. It was lovely eating it with our coffee. The three layers were nice especially the custard. The kids however didn’t like it as much. Their words were: “We like the cake top bit, but the custard tastes like scrambled egg”. 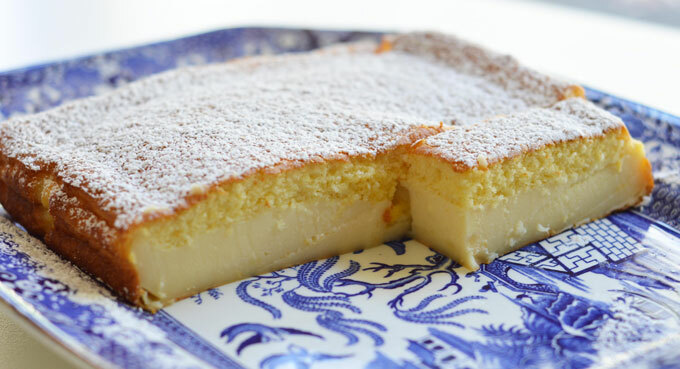 I have to say that the custard layer does have a strong egg taste, and I think that is because you are using four eggs. It still tastes lovely though. 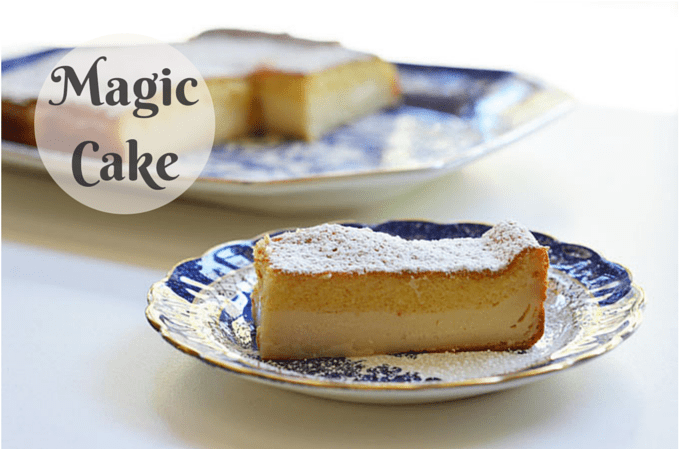 Have you ever tried making a Magic Cake? Wow, now that is magic and I am now pinning it too! I can’t wait to try this out, thanks!! 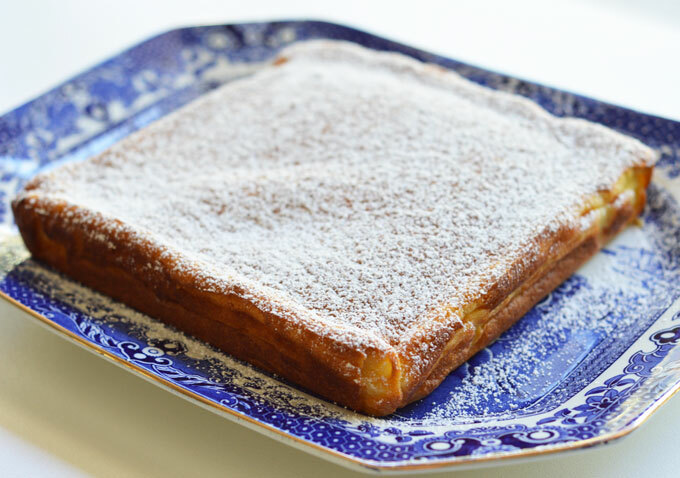 This looks so good, I like the way you end up with a custard base. Lovely photography too. I am travelling at the moment so I don’t have a kitchen – but in 10 days time when I am back in Spain this will be on the too do list! Thanks. I have tried a version of this with coconut which was OK but yours looks perfect with those two separate layers. Yum ! WOW! That is cool! I’ve always said baking is science for hungry people and this totally proves it. Actual magic. I have tried this before. Pretty cool how the layers form! I have never seen the Magic Cake before! You have me intrigued…..love how it splits into the layers. My kidlets would probably react the same way yours did, oh to be a child again! Thanks for the inspiration. Have a great weekend! How wonderful this cake looks!! I’ve never heard of this cake, but it looks so good I want a piece right now! Thanks for linking up to Pin-Worthy Wednesday, pinned & printed!